Should You Play At 777Coin Casino? 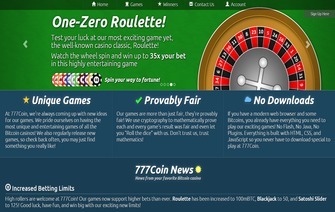 With its launch in June 2013, 777Coin.com established itself as a “provably fair” casino that offers players a few selections of games they can wager Bitcoin on. At first glance, it looks like a Bitcoin casino for players who have low bankrolls. With the max bets being quite below what other Bitcoin casinos offer, and with the fact they only offer nine games, some players may find themselves feeling the need for a little bit more. 777Coin might underwhelm the average player with the selection of only nine games that they provide. Aside from Blackjack and Roulette, 777Coin doesn’t offer any other popular games that players might expect to see at any other online Bitcoin casino. They offer a few select slot style game titled “Suits and Sevens”, “Bits and Bars”, and “Jewels and Gems”, each having the same sort of concept but different jackpots for each, accordingly. 777Coin also has a section of games labeled “unique games” that offer four selections of games that are unique only to 777Coin, but can be somewhat confusing to players who are new to the particular game. Players who wish to play these games are advised to read the rules on the right-hand side of the screen, in order to get an idea of how to play these games. In general, the games at 777Coin seem to be geared more towards players who enjoy higher payouts and slot-style games. 777Coin offers one confirmation withdrawals as well as one confirmation deposits. 777Coin provides a daily .1mBTC giveaway if you post in the thread on the Bitcoin talk forum, but otherwise is lacking in the bonus department. When it comes to customer support, 777Coin is one of the industry’s worst in both convenience and time taken for a response. 777Coin.com uses the “provably fair” bet verification algorithm to make sure that all games are completely fair and verifiable. With 777Coin being one of the early Bitcoin casinos that are still around today, an average player venturing to this casino for the first time, will be highly disappointed in what they have to offer. With only nine games, and more games a player wouldn’t recognize more than they actually would, it is a Bitcoin casino for a small demographic. While there hasn’t been any complaints as far as integrity or payouts, the support is lacking, to say the least, for any other concerns that a player may have. Overall, 777Coin can be described as “fair, but extremely lacking” when compared to what most other Bitcoin casinos can offer, in today’s online gaming sector.